Having traveled a fair amount for work this year (Los Angeles in June, San Francisco in September and Boston in October, it is strange to be traveling for myself. Just me and my belongings – a mess of sweaters, cables and cords and the November and December issues of Martha Stewart Living. No business cards (aside from the nine I always carry in my wallet), brochures or the business casual skirt or dress. But I digress. When I traveled for work I often logged into Boingo at the airport to catch up on work emails and would love to catch up on personal emails this time around and browse my friends' Facebook statuses (how's this one: "my return from x-mas plane ticket confirmation code is NOWYOU") but didn't feel like shelling out the seven dollars or whatever it is. 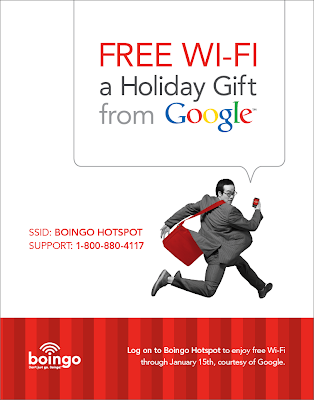 So while I'm flirting with idea of logging in, lo and behold I see a promotion from Google and Boingo – free airport Wi-Fi for the holidays!! See participating airports here. I'm off to Seattle for the first time ever. Stay tuned. I like to rate what I watch on Netflix and recently gave Flannel Pajamas two stars, which, on Netflix, is equivalent to not liking it. Did you like it? Flannel Pajamas stars Justin Kirk (Andy of Weeds) and the pale, freckly Julianne Nicholson. A quick summary: psychologist introduces two of her patients (unethical! ), so man meets woman, man and woman date, man doesn’t like her best friend or large dysfunctional family, for that matter, in part because woman is too into said large dysfunctional family. Man and woman get married, woman wants a baby, man wants one but not yet. I’ll stop there. Nicholson’s character, Nicole, annoys me. She seems like a difficult girlfriend, then fiancé, then wife. She is selectively bothered and Stuart comes off pathetic, paying off her loans, buying their apartment, helping her start a catering business. His love for her, which he professes over and over again, isn’t believable. And the film's title comes from something in the film that seems like an afterthought, just like Nicole’s mother being a painter, Stuart being Jewish. All in all, not a very good indie romance. Flannel Pajamas, which could also be called Dress Pants from The Limited, is available instantly on Netflix. 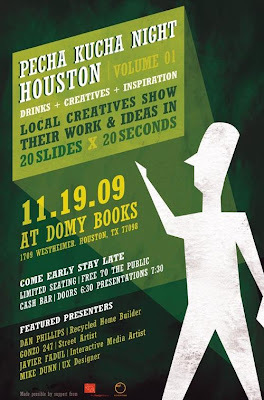 Pronounced "peh-cha-cu-cha'', a mix of show-and-tell, open-mike night and happy hour, Pecha Kucha has become the forum for ideas on design, culture and a lot else that has swept the world in just four years now having taken place in over 200 cities globally. Each presenter is allowed 20 images, each shown for 20 seconds each - giving 6 minutes, 40 seconds of fame before the next presenter is up. This keeps presentations concise, the interest level up, and gives more people the chance to present. RDA has been instrumental in helping organize and support Houston's inaugural Pecha Kucha presentation, so we hope you will come out in support of this fun event. 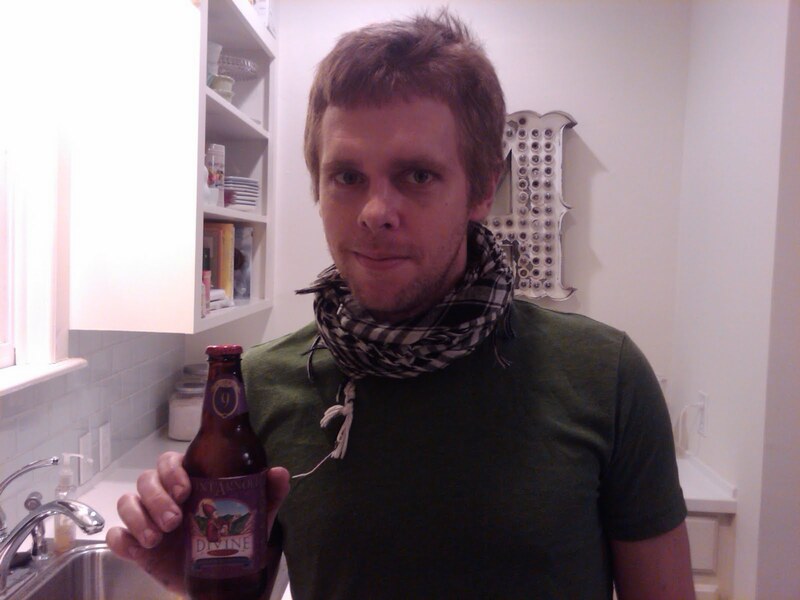 RDA Board Member and Cite Editorial Chair, Christof Spieler will be one of the main presenters! Doors open at 6pm for drinks and chit chat. Talks start at 7pm. The event is free and open to the public. Cash bar. Space is limited so get there early. 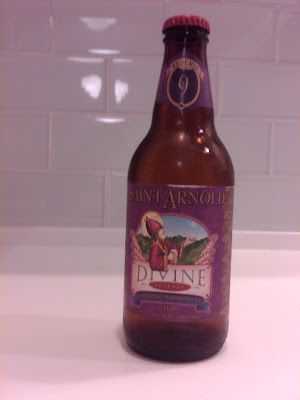 The #9 has a strong initial scent of nutmeg and cinnamon -- unsurprising, as Harris told us they used pumpkin pie spice in the recipe -- but that spiciness fades quickly and pleasantly upon drinking. Despite the fact that there quite literally is an entire pumpkin (canned pumpkin, at least) in every single keg, the pumpkin flavor isn't at all overwhelming. In fact, the tastes of caramel and chocolate are at least as strong as the pumpkin, owing in part to the dark malts that were used in the recipe. The result is a dark, creamy, strong, rich beer -- completely unlike any other pumpkin beers we've tasted (which tend to be mild, lighter and almost fruity). Sounds delicious, right? I get to try it tomorrow. Stay tuned for the report. 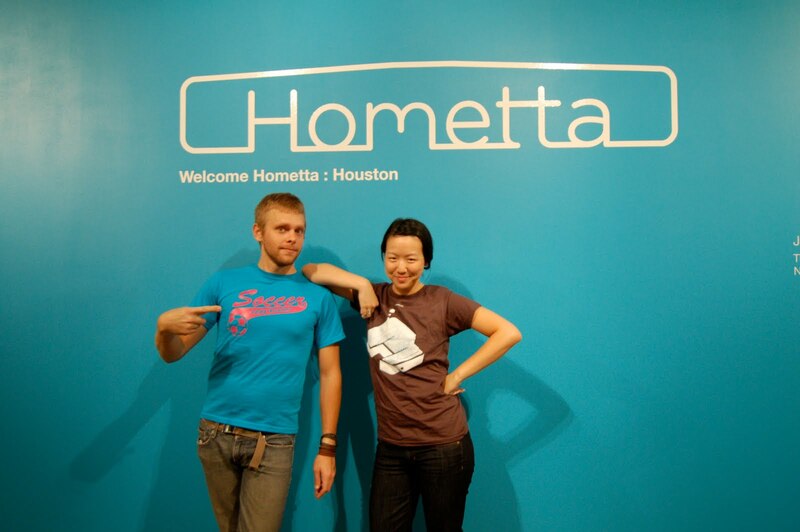 In other news, Welcome Hometta: Boston has been extended for a week. 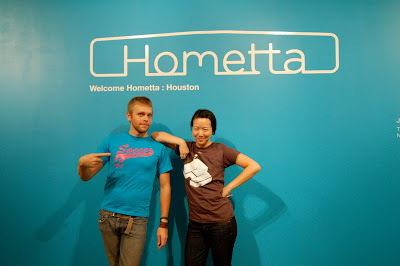 Go see the exhibit at pinkcomma gallery through Friday, November 20. Other people's babies are cute, sure. But your own nephew – is cute. Isaac, named after his paternal great-grandfather Ira, will be one month on Monday. Isaac arrived early in the morning on October 16, 2009, weighing in at 6 lbs. 9 oz. 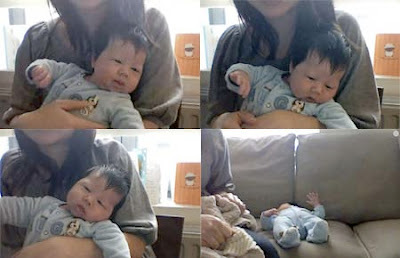 According to his mother, "He already cries fluently in English, French, Flemish and Mandarin. He says he is eager to meet you all, and that the food in Belgium makes up for the weather - which is not so bad after all." I wouldn't mind having an Obama baby myself (as in, having a baby under Obama's administration, not having a baby with the president), but in case I don't (I have seven years), I'll at least have an Obama nephew. My sister is doing well and looks great on Skype. While it's apparent a lot has changed in my sister and brother-in-law's life, not much has changed for me since becoming an aunt (they call me Aunt Ann). Except for the wallpaper on my BlackBerry (Isaac) and an increased interest in tiny clothes. And, if in a blue funk, I am cheered up by the mere thought of the little man. We will finally meet in December – at his paternal great-grandparents' in Boston – after his first transatlantic flight. Needless to say, I cannot wait. 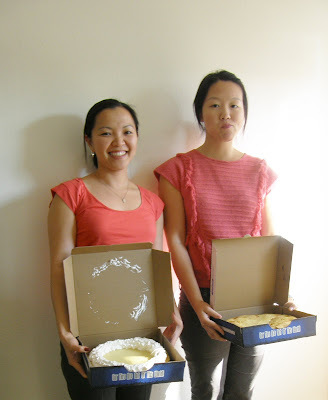 Here is a photo of my colleague Quyen and me holding our respective pies. School numbs my buns! Sadly, I am fast approaching the last disc of the second and final season of Twin Peaks. 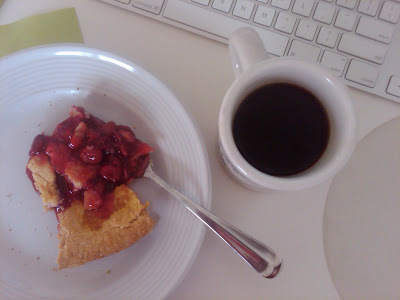 This week my craving for cherry pie came to a head (huckleberry is too obscure). Until this morning, my search had only yielded a $14.99 pie at Whole Foods and nary a parking space at House of Pies. I am happy to share that, thanks to my colleague, I have found a pie – the Flying Saucer Pie Company’s cherry pie. If you also find yourself in Houston with a craving for pie, I recommend going to the aforementioned Flying Saucer, where the pies “are out of this world.” The pies range in price from $8.75 to $10.75. They use only fresh eggs, all vegetable shortening, whipped topping (not on my cherry pie) and fresh fruit whenever possible; the pies contain no preservatives. And they claim to be the oldest pie shop in Houston operating out of the same location since 1975. I can only hope it’s as good as that of the Double R Diner.